When in the course of political life -- to paraphrase a great politician -- I run for office and assume among the county's parties the equal station to which my point of view entitles me, a decent respect to the opinions of my friends requires that I declare the causes which impelled me to the decision. This essay, completed in mid-December 2004, reviews the events which brought me to run for Charlevoix County prosecutor against Republican John Jarema, describes the campaign, and summarizes the results and prospects of the Green Party in the Charlevoix area. Four days before releasing this publicly I uploaded a draft privately and gave email notice of the release date to John Jarema and Mary Beth Kur, soliciting corrections or comments. None came. Charlevoix is a small county. This summary uses mostly first names. "I wish John Jarema and the county all the luck in the world. I thank all the voters whether they voted for me or him." Jarema said he wants to thank Boal for running a good, clean campaign. Now that he will be taking over the position in January, Jarema said he plans on moving forward and sitting down with the current staff and seeing who wishes to stay and getting everything in order. More complete results are shown below. The campaign began inadvertently on July 20 when I chaired a nominating caucus of the Up North Green Party at the library in Boyne City. The meeting had been noticed officially, with postcards and emails to our list. Triumphal plans of the Up North leadership were to nominate JoAnne Beemon, our shoe-in incumbent Green county drain commissioner. JoAnne had served heroically for four years, playing an important role at her dollar-a-year salary in keeping Wal-Mart out of Charlevoix. At the national GP convention in June, she was nominated for president as Michigan's favorite daughter. As a Green Party candidate I dared to challenge the political machine of Charlevoix County. Things are not business as usual. More important than corporate profit are fair wages and family well-being. More important than the gross national product is clean water and air. These are the things the Green Party stands for, a sort of new hope that I am proud to be a part of. I myself had no political ambitions. I had been active in defeating Wal-Mart's plans to locate in Charlevoix and in the so-far unsuccessful Teamster nurses' strike at Northern Michigan Hospital, but was otherwise little known in the area. Besides I preferred the life of a faceless apparatchik, letting others be the ones out front. "Ellis, aren't you going to run for something?" "No one would vote for me. I'm new to the county. I'm not religious. I'm a Red. I'm doing huge amounts of work as it is. And I'm in divorce." "Why don't you run for prosecutor?" "Who wants to be a bureaucrat?" "People shouldn't have to go to jail." Everyone was polled. Except for me, 100% wanted me to run. The deadline for accepting was the next day at the county clerk's office. We left it that I was considered nominated for any county or township office I wanted; I could go to the clerk and fill in my name anywhere. The next morning I called my Hayes Township supervisor Tim Boyko to ask what he thought. He was interested but non-committal. I decided against it. Later in the day I met JoAnne and Joe King, our Green candidate for township trustee, to help fill out their acceptances. JoAnne was angry when I told her my decision. "You have to do it. I need your support." "Would this involve a lot of work?" "No. You don't have to have signs, you don't have to campaign, you don't have to do anything." I noticed there was a three-day time period within which I could back out. Weekends did not count. I could have till Monday. I started to waver. I actually didn't have any big work deadlines looking at me at the moment. Just the monthly Labor Notes and Internal UAW Appeals uploads, plus in September a new lawsuit to start in Detroit, an oral argument in Cincinnati, a memorial service for Victor Reuther, a glee club concert in Charlevoix, and a Little Traverse Conservancy organizing meeting, and in October a 9/11 forum in Petoskey, a panel presentation on Palestinian refugees in Alabama, and another glee club concert in Petoskey. And I knew during October at the NCMC computer lab Fred Harrington would let me work around the campaign. I wanted a meeting of committed supporters, I said, to see what kind of a base there was. I signed the acceptance form for prosecutor. The next day Keith Matheny of the Traverse City Record-Eagle called about something else. After chatting awhile I told him I filed for prosecutor, but I can change my mind till Monday so don't print this for now. He said "You just told me something in the public record. My readers expect me to print news when I find out about it." He outed me on Friday. On Saturday, JoAnne, Tim, Anne Zukowski, and I met at the library. Fecklessly I set out the many reasons I was a poor candidate. They would have none of it. Until the nomination my vision of a political campaign was a cartoon. I thought the job of a candidate was to swagger about, telling jokes and lies. I guess this was one of the reasons I resisted it. Anyway, despite JoAnne's assurance I jumped into it with both feet. ... while there is a lower class, I am in it, and while there is a criminal element I am of it, and while there is a soul in prison, I am not free. While still in prison in 1920, Debs received nearly a million votes as the Socialist Party's candidate for president. After many discussions and meetings the brochure -- which ended up as the front page on the website -- was pretty bland. Debs got iced. Highlighting corporate responsibility, the points were fairness/justice, rehabilitation-oriented sentencing, healthy activities for teens, prosecute domestic violence and environmental violators, support elected officials, educate residents in government, open-door policy, and best practices for waterfront development. Meanwhile the Republican primary was heating up. Former assistant prosecutor John Jarema was taking on Mary Beth Kur. She had fired him for disloyalty in 2002. He sued. They settled with a $50,000 judgment in 2003. In January 2004 he announced his candidacy for the position, promising fiscal responsibility and full-time attention to the job. According to one news account the candidates were in each other's eyes "evasive," "divisive," and "appalling." In the August 3 primary, John edged out Mary Beth by 3055 to 2868 (with 6 write-ins), or 51½% to 48½%. This was a surprise because of one stunning feat Mary Beth pulled off at the end of the campaign: She collected 1064 signatures of supporters whose names appeared in an ad in the Charlevoix Courier on July 28. The Record-Eagle's report on the primary picked John as the "overwhelming" favorite over me in November. A few days later I called him to introduce myself, congratulate him, and buy him lunch and discuss the general election. Returning the phone message, he apologized for telling the media he was going to start gearing up for the office, without realizing he had an opponent in November. I appreciated that. At our lunch we joked that Mary Beth might mount a write-in campaign. He asked if I was running to win. I said I was, and told him my issues, support for JoAnne and the environment. I gave him drafts of my litigation history and my brochure -- still containing the Debs quote. I invited him to take the JoAnne issue away from me by agreeing on it. I showed him legal authority for her regulations, in the form of a June 14 letter from Geoffrey Seidlein, a Lansing attorney knowledgeable in drain law. John was interested, and later he did come out publicly for a drain commissioner salary. On the budget issue, he suggested we have a joint approach to Mary Beth and the commissioners to learn their plans for 2005. I agreed. I called Mary Beth to schedule a lunch with her. We arranged a call-back time, but when I got back she said she would not meet till after the election. As to the budget, she was to issue a recommendation by the beginning of October, she said. The commissioners would decide budget issues by the end of the month, before the election. She refused a copy of her intended proposal, and referred me to the current year's budget. I obtained a copy. Seeing no problems with it I assumed -- incorrectly it later appeared -- she would propose a similar budget for 2005. I faxed a copy to John and let the matter drop. As to their litigation, I told both that a $50,000 judgment meant his suit had at least some merit. But I took no public position on it in the campaign. Never having run for office, I got concerned about the nuts and bolts of a campaign. I called Shirley Gibson for a suggestion for a campaign manager. Murray Kilgour, she said. He had managed Mary Beth's campaign. I was a little distrustful of that -- as was JoAnne -- but I called him and he came over for a long meeting in mid-August. Tim joined us for most of it. I told Murray my concerns. I had not asked Mary Beth for her endorsement, and did not want her list of supporters. He understood completely. He was not a Republican, and had supported environmental causes in the past. He would vote for me and give detailed advice. But he did not want to come to meetings, make phone calls, write letters, or be a manager. He recommended I be my own manager, in line with how a Green should operate anyway, he said. He recommended a budget of $5,000 to $10,000. He said he would email me a more detailed recommended budget and timeline for ads and cards. On August 22 he came up with a $9000 budget and recommendations about fund-raising, volunteers, program, township and organization meetings, door-to-door, fund-raisers, literature, and ads. As to the website, at first Murray wasn't terrifically enthusiastic. But he warmed to it as I nursed it along. I had started on a resumé before the campaign, but I ended up still having to spend days tracking down my litigation history. "'Wow'. Very thorough," Murray said on August 30 when I finally posted a draft. Meanwhile Bob Hamil was spending enormous amounts of time formatting the PayPal donation button on the site. By September 6 he got it working. Murray had been skeptical it would collect any money at all. But after some test deposits by Bob and myself, it managed to gather $420 from 10 contributors (including one overseas), before deducting PayPal's fees. I decided on Friends of Ellis Boal as the name of my organization. The first check was on August 17 for $25 from cousin Lisa Borus. On August 23 I opened the account at Charlevoix State Bank. I called Char Sanderson and asked her to manage it. She agreed immediately. I started to map out campaign appearances. The county and the townships have a curious policy of allowing citizen comment at every meeting, where anyone -- even a political campaigner -- can come and say what they want for 3-4 minutes. I got a county book, with the names of all the officials and times and locations of regular meetings. I made innumerable calls confirming times and dates, letting each township know I would be coming. Two initial concerns were the pledge of allegiance and my historic negative won-lost record in court. The pledge of allegiance doesn't express my view, and it's a waste of time at meetings. I haven't said it since high school or college. When others do, I face the flag like everyone else and just stay silent. No one has ever commented negatively on it, but I was nervous people would during the campaign. The issue never came up though, and half the townships don't say the pledge anyway. So that seemed to evaporate. As to my record, my detailed biography lists all the reported cases I could track down. It includes a few that might not actually rate as "reported." Readers wouldn't know unless they looked up and tabulated the cases that cumulatively I lost maybe two-thirds of them. Too well, I know the reason is not that I skimp on research or don't track down leads. So what is the reason? When I discuss this with friends most say it's because I take hard cases. But something inside always suspects there is something wrong with my judgment. For most politicians the question whether to talk about this would be a no-brainer. But I knew John would be vetting the site and calling lawyers I had litigated against. In the end I decided to acknowledge the fact, say I handled labor and employment cases against companies and unions, say I never represented an employer, and say occasionally I did score and did set precedents. Then let the voters decide about my judgment. The first township meeting was on September 1 in Hudson Township, in the far southeast corner of the county. Gas wells are being drilled there, I found out, bringing complaints about the noise and placement of above-ground pipes. After the meeting I tried making some calls and digging up research on the issue, so I could get back to them if I found anything useful. I didn't get very far and the issue slipped away. Not being a general practitioner, I know little about the everyday legal questions most other lawyers do know, like zoning, contracts, criminal law, etc. I thought I would get questions about stuff like that during the campaign. I also expected to be asked about abortion, gun control, death penalty, maybe Iraq, and similar hot issues. But none of these ever came up, except for one question from one voter about guns. Only once did someone test me by asking what the law was on a specific point, something about zoning. This was on Beaver Island. Luckily two other lawyers were present, including John. I let them take the lead and sagely nodded my head to everything they said. Meetings of 12 of the 15 townships. Meetings of the Boyne City, Charlevoix, and East Jordan city councils. Four meetings of the county commissioners. The BASES Teen Center twice. The soil erosion control office. East Jordan Iron Works and Cemex. Four joint appearances with John. Door-to-door walk-ins in the concentrated business sections of Advance, Bay Shore, Boyne City, Boyne Falls, Charlevoix, East Jordan, St. James, and Walloon Lake. Proceedings in district court about six times on Tuesday mornings, and probate court once on a Wednesday. On Beaver Island I stayed with Jim and Dorothy Willis, and raced a 5K on the second day. Wearing my Green Party t-shirt, I came fifth overall and first in my over-60 age group, in 24:46 on an overlong course. Hello. 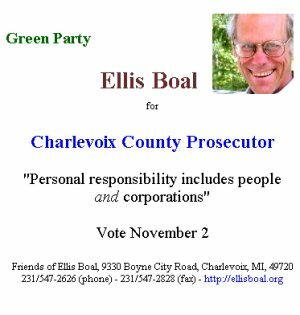 I am Ellis Boal and I want to be prosecutor of the county. Here is my card. I am with the Green Party, and my website ellisboal.org is the best reason to vote for me. I have litigated in six states plus Puerto Rico. I am admitted to four federal courts of appeal. Two of my cases are precedent-setting cases studied in law schools. In one I was commended by Judge Breyer (now on the Supreme Court), who approved two 25% fee enhancements because of the excellence of my work which clarified the law in a legally difficult area. In another case I set back a Detroit Mafia member by $6000 for wrongfully suing a union member. Last spring I was part of leadership of the committee that defeated Wal-Mart in Charlevoix. Details are all on the website. My field has been labor law so it will be a switch for me to criminal law if I win. But the two areas are similar in that both deal with the problems of ordinary people facing the rules of society. Besides, criminal law is a first-year course in law school, and you take labor law in the second or third year. In Charlevoix I want to protect the environment and regulate the corporations. But first of course I will concentrate on the main job of the prosecutor which is to keep drunks off the road, stop fights, be proactive in the schools, and such like. These are the non-precedential cases, the ones that don't go to the supreme court, where people act in ugly ways and the job is no fun. But I'm committing to do that for the people of Charlevoix County. My opponent John Jarema will also do a nice job if he wins, so the county is fortunate to have two good candidates running. What you get with me is a broad-range perspective and a concern for the generations to come. Well, that's my pitch. Take a look at the website, and thanks. The local Republican Party opened its Charlevoix headquarters in September. I decided to stop by the day it opened. I talked to party official Phyllis Haggard to ask about follow-up from an incident when the office opened in 2002. A high-ranking Republican official had come and urged voters to reject the Democratic candidate for secretary of state because he was a black attorney from Detroit. I showed her the Courier article reporting the statement at the time. Phyllis justified it, saying the Democratic black candidate had also played the race card when campaigning downstate. Diane Gustin also introduced herself to me there. She was hosting John's October elite barbecue. She invited me to come free and hand out my literature. She said bring my wife. I said my wife is divorcing me. She said bring her anyway and show everyone it's amicable. Except for the wife part, the idea was intriguing. I said I would get back to her. When I did a week later she said the free offer was good only for that day. Now I would have to pay $200. The flyer said the ticket price was $200. I declined. My most interesting conversations were with conservatives and skeptics, informed people who were probably going to vote against me. Ed Wojan on Beaver Island was one. He said he knew JoAnne. He wanted to be sure I was going to do the everyday work of a prosecutor in the trenches, and not just preach the GP line. I challenged his view of JoAnne's work ethic. But he seemed sincere, and the conversation made me think a lot. From then on my talks emphasized commitment to the prosecutor's ordinary duties. It is an important office. Drain regulations were one of the factors that kept Wal-Mart out of Charlevoix last spring. By state law the part-time drain job involves at least a day a week in the office, plus meetings and inspections elsewhere. Republican challenger Marc Seelye hopes to unseat incumbent Green drain commissioner JoAnne Beemon in November. If he wins, Seelye intends simultaneously to continue his present job as soil erosion control officer. He would be right to try to continue it. It's important, full-time work. He does it effectively. But it would be impossible. He could not do elected drain duties and appointed soil duties at the same time. The week has only 40 hours. Elected duties must take precedence. For years, even before Beemon was elected, Charlevoix commissioners dealt with the conflict by squeezing the drain office. The pay is only a dollar a year plus per diems. These are the wages of a slave. The office needs a reasonable salary. Otherwise, Seelye if elected would be sorely tempted -- as anyone would be -- to short-change or skip the drain duties. If Beemon wins, she would have to continue with no compensation or health benefits. Fortunately, at the October 20 retired teachers meeting John came out publicly in support of a salary for the drain commissioner. September 23 I met with George Lasater, the sheriff, in his office. I knew him from the time he came to the house in 2001 to tell Mom that Dad was dead in an accident. We had talked at the Horton Bay Labor Day bridge walk at the start of the campaign. I had thought he had endorsed John, but it turned out he had only allowed him to use a complimentary quote and had allowed Mary Beth the same. He doesn't take sides, he explained. That sort of surprised me, particularly for the general election given that he and John are Republicans. Anyway at our meeting he reviewed the procedures and relations of his office to the prosecutor's. We talked about the controversial use of undercover officers for drug buys, which is how they had caught Charlevoix city attorney Jeff Van Treese several years ago. On corporate crime, the only example he mentioned were builders who promise a home for someone downstate and then take the money and run. Though he has jurisdiction to investigate federal crimes, he hasn't been involved in any environmental investigations. I asked if local law enforcement was burdened by demands of the recent federal anti-terrorism laws and he said no. He showed me around the office, introducing me to everyone, including Chuck Vondra the union steward (and a Boyne City commissioner). We went into the jail's control room, where we saw the inmates through one-way glass. We looked in on a class where an instructor was reviewing legal arrest procedures for about 20 cops from different counties. I was impressed. A few weeks before that, in district court I watched a defense counsel's motion to suppress the results of a search in a marijuana possession case. Two kids on bikes had ridden by a Boyne City police car taunting the cop. He followed them to a gas station. He noticed one had a legal knife and testified the kid was nervously putting his hand near the pocket where it was. He also noticed something in the pocket. He patted down the kid and found what the kid admitted was marijuana. The kid testified disrespectfully, referring to the officer by his last name alone, omitting the rank. As I watched, an old case came back to me from the time I was researching gun laws in law school, Terry v Ohio. This was the case with which I had beat my own marijuana arrest 33 years ago. Defense counsel argued yes drugs are bad, but there are larger issues at stake here. I thought "this is a no-brainer, the search is illegal," and wondered why a warrant had even been authorized. But cynically I remembered Judge May is a former prosecutor. So I was shocked when May actually granted the motion, and let the kid walk. I congratulated the lawyer on my way out, and handed her a card. I mentioned May's decision to several people over the next few weeks saying I agreed with it. This included the sheriff, Mary Beth, Scott Kelly, and John Puzzuoli, the assistant prosecutor who had brought the case. In the August 11 Courier interview I said one of my reasons for running was to bring local environmental and corporate law breakers to justice. I said I would identify particular violators after a few weeks of study. Shortly later I began to grow nervous about fulfilling the promise. I found the Scorecard site which identifies the high "Toxic Release Inventory" (TRI) polluters in every US county. I softened the position some by putting a bullet on my faq page referring readers to the site, and saying the companies identified there are probably operating within the law, but I would be watching them anyway. The idea that there could be such a thing as unfairness to a corporation doesn't sit right with me. But I took it to heart and removed the faq. Still, I felt I had to either vindicate my statement to the Courier, or call the paper and recant. I finally hit on the idea of visiting the polluters, pointing to my Courier statement and the Scorecard data, and hearing out their reactions. I chose East Jordan Iron Works, Cemex, and Lexamar. EJIW was first, on October 5. I presented myself and the Scorecard data at the front desk, and told the receptionist I was running on an anti-corporate platform. I asked to speak with someone in authority about its environmental record. Shortly environmental manager Richard Hodge appeared. We talked for 30 minutes. I told him of my evolution starting with the Courier interview, and added I knew there had been a death at the plant a few years ago. He was cordial and answered my questions, noting the company was not now looking at any compliance issues. I thanked him and left. The next day he faxed with a follow-up answer, for which I called and thanked him again. I didn't come away with any evidence. The next corporate stop was at Cemex on October 15. Bud McCormick the plant manager met with me. He was charming, and began by telling me to tell JoAnne he had a Christmas present coming for her, regarding the Medusa Spur recreational trail she has worked on for several years. Dust in the air is the main issue at Cemex. But the very purpose of the plant is to make dust, he said. He gave me a pile of reading material. As I was leaving he said wait, I want you to meet someone. I could see he was holding a picture of my 1957 Charlevoix summer softball championship Peanut League team from the website. In walked Jerry Drost, my teammate sitting next to me in the picture. I was shocked. He was all smiles. Jerry and I reminisced for a few minutes, and promised to get together soon to play catch. We shook hands heartily. It was very sweet. The last corporate stop was at Lexamar in Boyne City, probably October 12, though I don't have noted the specific date. I made the same inquiry, and showed my literature and the Scorecard data. The receptionist took them, and after a few minutes returned with the business card of Donald Januszek, the Lexamar health, safety, and environmental engineer. He didn't have time, she said, and I could call him. I said, well I made the effort to come here, and he can call me too. I left. Neither of us did. A couple of weeks after the election I read that Cemex had sold the plant. By chance Bud McCormick hailed me in a shopping center a week later, walking with two of his kids. "You still have a job?" I asked him. He wasn't sure. In mid-September I ran into John at district court one time. He told me the campaign cards I was handing out violated the campaign finance laws because they said "Friends of Ellis Boal" on them, rather than "paid for by Friends of Ellis Boal." I said Friends of Ellis Boal did pay for them. He said cards still have to say "paid for by" because otherwise voters might think someone else paid. He considered the matter minor and said he would not file a complaint. I gave the "paid for by" issue a good deal of thought. Friends of Ellis Boal wrote its very first check for these cards. No one seeing the name, address, phone, fax, and website on the card could mistake that. I emailed Murray. "Technically I suppose he is right" he answered, and recommended putting the caption on future items. That didn't answer what I was to do with the 1000 hand-out cards I still in hand, which omitted the words "paid for by." I presented the issue to the September Green Party meeting. I said I was inclined to go ahead for now and distribute the remaining cards until I got new ones. I was overruled, on the thinking that a candidate for prosecutor must uphold the law scrupulously. Ten of us spent the last 30 minutes of the meeting writing "paid for by" by hand on each card. On October 7 the News-Review reported that Jane Brannon, the Republican county clerk, had fined John $4625 for tardy filing of three campaign finance reports related to the Republican primary. One had been due July 27, and the others on August 3. He filed them September 2. Fines are set by a schedule which increases for every day late a report is. As of November 11 John was still contesting the fines and hadn't paid. On October 28 the News-Review reported that three new campaign finance charges related to the primary had been filed against John -- by Murray. One involved form letters John had sent to absentee voters without information about who paid for them. Another was about payment for a mailing done from John's law firm. The third said his campaign income and expenditures didn't match up. This was all news to me. Murray and I never discussed John's finances. After the election the state dismissed the new charges. Murray said later the dismissal was not on the merits. After the election I discovered I too had probably violated the law about timely reporting of campaign loans. Jane Brannon hadn't noticed it. Prosecutors are held to higher standards, I remembered, and I turned myself in. She fined Friends of Ellis Boal $75. We paid. The final campaign finance report for Friends of Ellis Boal shows total donations of $6563.53 and total deposits of $6543.68. The difference, $19.85, is PayPal's fee. The expenses were $5089.71. Of my $3000 loan, I will get back $1472.32. There were also in-kind donations of $75.97. There is a discrepancy of $1.50 in these figures. Char spent hours trying to reconcile them. In the end we filed them with a note saying we are exhausted. The major expenses were for the hand-out cards, the ads, the mailed postcards, and 23-cent stamps. For the price of reproduction and mailing, interested readers can get copies of our campaign finance filings from the county clerk or from me. I decided against yard signs. Murray convinced me they would be wasteful and non-environmentally friendly. For the postcards we used a qualified voter list the GP had obtained from the state. Lisa Weltman in Detroit prepared labels sorted by zip code and street, and emailed them to Lou Awodey for printing. At the GP meeting October 19 we labelled and stamped half of the 9800 names on the list. We farmed out the rest for people to take home. While I was in Alabama Char and Jean Engstrand rode herd on volunteers, making sure they got everything in the mail. Then the cards started coming back, by the thousands. The state's list is horribly outdated, it turns out, and a lot of time and money was wasted. It would have been better to get it from the county, but it probably would have cost. Jean arranged for quarter-page ads, including with green color, to be run in the Courier, News-Review (two), and Boyne City Citizen/East Jordan Journal. John had only one ad that I saw. I don't know of any mailing he did. He had some yard signs, but to my recollection not in the same quantity as in the primary. The signs went up after his elite October 9 fund-raiser. I assume the modest effort was because of donor fatigue and the fines. At one point in late September John called and left a message that the county commissioners had decided to lower the prosecutor's salary for next year, from $84,700 to $55,000. Budget was his issue not mine. We had discussed it at our lunch but I had let the matter drop, assuming Mary Beth would recommend a continuation of the same budget. A few days after John's call I started to investigate anyway. I was piqued by what commissioner Vic Patrick told the News-Review, that they were acting based on John's primary campaign promises to reduce staff. The problem for me was the general campaign wasn't over and John might not end up as prosecutor. Besides, salary should be determined by the office, not the office-holder. Checking with the clerk I learned that when Mary Beth was first appointed in 1995 she got a salary increase and kept it in her first election. I called Valerie Snyder, the commissioner for my township. She pointed out Mary Beth was appointed to fill an unexpired term, and the relevant inquiry should be what happened to the salary the last time an incumbent was defeated by election. Checking further I learned this is exactly what happened when Richard May defeated Kraag Liberman in 1993, that he got a $2100 raise. I called Valerie back and left a message. She didn't return the call. I prepared written comments for a commissioners' meeting of October 4 -- including about the drain commissioner's salary -- and put them on the website. Others saw them and suggested I write an op-ed for the News-Review. The paper ran it on October 12. Mary Beth responded with a petty piece on October 15, belittling both John's and my experience, and assigning this as the reason for the salary cut. I replied with a letter arguing it was the voters not the commissioners who should evaluate the candidates. In late October John told me he too had submitted an op-ed. The News-Review rejected it because the issue had become old news. To a lesser extent, I also took on Mary Beth for moonlighting in her lame duck period. She is entering private practice in Petoskey. She had started the new job though she continued to hold a full-time elected position through the end of her term. I heard she had argued a motion in a divorce case before Judge Pajtas in early September. I looked at the case file in the clerk's office, and sure enough there was her name as co-counsel. The clerk showed her address as 203 Antrim Street, the prosecutor's office. The moonlighting issue came up at a commissioners' meeting on October 27. I appeared and said voters have a right to expect the prosecutor to be on duty throughout the day, and if she has private work she should do it off the clock. This appeared in the News-Review, and probably lost me votes among Mary Beth's supporters, John told me at a meeting in his office after the election. He appreciated I had taken a stand on principle. My print media coverage was good. I had two interviews, an op-ed, and a few letters for me to the editor. John's was bad. His news covered only the campaign finance violations. There was no interview though I assume he had one during the primary. To the extent that the budget was an issue, we agreed but I was the one out front on it. My first interview was by telephone in early August with Jeremy McBain of the Courier. I told him I wanted to bring Green values to the prosecutor's office. He asked what Green values were involved with what the prosecutor does. I wasn't prepared. He was on deadline, but agreed I could call him back in 30 minutes while I thought of an answer. Crime is brought about by social conditions. Transform society to feed, clothe, and educate the children. Bring environmental and corporate lawbreakers to justice. The companies to be named later. Support JoAnne Beemon, the drain commissioner. The story and my picture appeared at the top of the front page. In response John told the Courier he was taking my campaign seriously. The article was well received, and I made copies as hand-outs for my appearances. The News-Review interview went much easier. Fred Gray came to the house. I started it by showing him labor law textbooks with my cases reprinted, Breyer's opinion about my work in Maceira, my biography in Who's Who In American Law, and materials on the Mafia case. That set the tone for the rest of our discussion, and it was very comfortable. He did a nice job summing it up. Later I asked him "whatever happened to adversarial journalism?" "I do this for all the candidates," he said. Traverse City Record-Eagle, July 23, "3 in Green Party to seek election." Announcement of nominations of Beemon, Boal, and King. Traverse City Record-Eagle, August 4, "Charlevoix prosecutor loses to former employee." Jarema stunned Kur, and will be the overwhelming favorite against Boal in November. Traverse City Record-Eagle, August 8, "Expanding Green Party chooses candidates." Picture and short article. Petoskey News-Review, August 4, "Jarema wins in Charlevoix." Jarema narrowly defeated Kur in the Republican primary, after speaking with 1000 door-to-door voters in four months of campaigning. First he will meet with the members of the office and see who wants to join his team. Charlevoix Courier, August 11, "Not a done deal for Jarema." Republican Jarema will face Green Boal in November. Boal interview and biography. Charlevoix Courier, September 1. JoAnne letter to the editor, "Drain commissioner needs support." Petoskey News-Review, September 17, "Green Party chair challenges Jarema for prosecutor's post." Interview and biography. Charlevoix Courier, September 29, "Meet the Greens." Announcement of GP candidates' meeting. Petoskey News-Review, September 28, "Charlevoix Men's Chorus performs Sunday at Crooked Tree Arts Center." Boal on electric bass. Petoskey News-Review, October 12, "Commissioners need a better method for determining public officials' pay." Boal op-ed re the county's budgetary manipulation of the prosecutor's and drain commissioner's offices. Petoskey News-Review, October 15, "Salary of newly elected public officials is rightly based on experience." Kur op-ed responding to Boal's re the prosecutor's budget. Charlevoix Courier, October 13, "Green Meet." Picture of four GP candidates. Charlevoix Courier, October 20, "Beemon, Seelye run for drain commissioner." Interview with both. Charlevoix Courier, October 20. Two letters to the editor supporting Beemon, one criticizing Kur for moonlighting. Petoskey News-Review, October 26. Boal letter to the editor, "Commissioners belittle candidates." 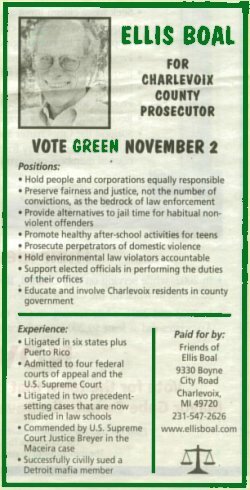 Charlevoix Courier, October 27, "Vote for JoAnne Beemon and Ellis Boal." Bill Henne letter. Petoskey News-Review, October 28, "Campaign finance irregularities alleged in Charlevoix." Complaints by Murray Kilgour. Petoskey News-Review, October 28, "Board slashes prosecutor's salary; drain commissioner still gets a buck." The Board has earmarked $30,000 to retain civil counsel. Petoskey News-Review, October 28, "Green vs Republican for Charlevoix drain post." Summary of campaign. Petoskey News-Review, October 28, "Green vs Republican for Charlevoix prosecutor." Summary of campaign. Charlevoix Courier, November 3, "Voters head to the polls." Jarema beat Boal, 81% to 18%, thanks him for a clean campaign. Petoskey News-Review. November 3, "Jarema defeats Boal in race for Charlevoix County prosecutor." Boal wishes Jarema and county good luck. Petoskey News-Review, November 11, "Prosecutor-elect asks board for more money." Jarema asks the commissioners to increase the prosecutor's funding for 2005. In a contentious meeting, commissioners say he can organize the office how he wants but must work within the board's bottom-line budget. Petoskey News-Review, November 11, "Election bureau backs Jarema." The bureau rejects the campaign finance charges brought by Murray. Petoskey News-Review, December 9, "Drain commissioner Beemon rips Charlevoix board, charges board with being in pocket of developers." Truth to power. By the time of election week I hoped for an upset but privately thought I would get votes in the 40% range. Many people I didn't even know kept saying they were voting for me, either because they had heard of my campaign or in responding when I introduced myself. A few people recognized me on the street from my picture in the papers. A deputy county clerk said I had a good chance. The register of deeds introduced me to everyone in her office. The sheriff did the same. A clerk in a grocery store said he hated John because of his suit against Mary Beth, and was going to tell his friends to vote for me. The head of the East Jordan Chamber of Commerce said she was voting for me. The host of John's $200/plate fundraiser said it was going to be close. John's print media coverage was bad and mine was good. He only had one ad that I saw, and no letters to the editor. His yard signage was down from the quantity in the primary. And my campaign was positive. I remember once I was driving in the car somewhere right after the Republican county clerk nailed John for the $4625. I had an enlightenment. I said to myself, "That's it. Right there. I just won." Why? When John had pointed out my hand-out cards lacked the paid for by wording I fixed it immediately. Now here was John violating the laws so badly he was charged thousands of dollars, and the News-Review put it on page one. His whole campaign was based on fiscal responsibility, and the story just blew that to pieces. How could anyone vote for him? But friends counselled to the contrary. It was just a paperwork violation, they said. That was pretty cynical, and made no sense to me. But it was the prevailing view. Well if it doesn't convince voters to dismiss him, I thought, at least it will cut into his campaign budget. People going to the elite barbecue would be paying for his fines, not his campaign. Click picture to listen. Problems? Email me. monthly Labor Notes articles to its website. Also, my four-day divorce trial was to start the Monday before the election. I spent considerable time in the week and weekend leading up, helping to assemble exhibits and prepare testimony and cross-examination. We ended up settling by noon. I was able to start the Labor Notes work. The November song was an adroit and lovely a capella banjo medley by Kelly Wideman, a union bricklayer I know in Missouri. That evening I also got literature to a new supporter who had read about the campaign and wanted to distribute it near polling places. Election morning was cold and drizzly. I had intended to do nothing, but changed my mind and went into town to stand with JoAnne on a corner opposite the Charlevoix polling place. Other candidates were there too, Norm Carlson and Sherm Chamberlain running for mayor and city council, neither of whom I had ever talked to. It was an interesting confab, watching them all be the best friends of the passing voters. Even JoAnne did it. Not knowing the voters I mostly said nothing. But I entertained the others, reciting the Debs quote and quizzing the others trying to figure out some of the local city issues. Norm recommended I keep Debs under wraps. During the 2000 campaign when JoAnne and Ralph Nader were running, 25 people or more would attend the weekly Green meetings at the Dilworth Hotel in Boyne City. Since then activity has tailed off, and I was concerned about the level of support there would be this year. There were a couple of reasons why the concern turned out to be unnecessary. First, building a campaign is different than building a party. If something needs to get done, you can just do it yourself (at least in a small area like a county). In important ways, other people can't do the work for you anyway. It's you that people will be voting on, so it's you that has to get out and meet the voters. Second, as the campaign developed people did come on board, some in unexpected ways. About 10-12 people would come to our regular Green Party meetings, the most important of which was the October meeting where we mailed out the postcards. 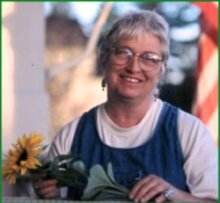 Ellen Addington was an early and energetic supporter, organizing lists of volunteers and promoting the Green campaigns at several gatherings. One was a packed meeting in October at the Charlevoix Democratic Party office with Senator Carl Levin. Lou Awodey, my old skate-skiing instructor at Connections North, diligently formatted and printed the literature. JoAnne Beemon helped develop platform and made me run in the first place. Tim Boyko was an early and energetic supporter who also helped convince me to run. Stephen Brede took the picture which decorates my hand-out cards and the pages of this site. Jean Engstrand designed the postcard and newspaper ads and arranged ad scheduling and prices. Bob Hamil initially designed the website and doggedly programmed the online donation page. Murray Kilgour gave confidence and insightful suggestions about campaign message. Char Sanderson kept track of the money. Lisa Weltman selected Charlevoix addresses from the state party's statewide qualified voter list, and emailed them to Lou for mailing labels for the postcards. Dorothy Willis, my babysitter at age two, managed my campaign on Beaver Island, including putting me up overnight and lending me a car. My relations with John after our lunch remained cordial, even warm, through the campaign. He had apologized in our first phone conversation for starting to assume office after the primary, not knowing of my candidacy. He pointed out the clerical paid for by error on my campaign literature. He alerted me to the salary issue. He gave me a ride to my car parked at JoAnne's house after we flew back together from Beaver Island. He confessed the News-Review had refused his op-ed. And at the teachers meeting he came out publicly in support of a salary for JoAnne. I do have small complaints. His website said incorrectly he had drafted the county's current (2004) stormwater ordinance. He didn't reciprocate with a link to my website on his, as promised. In the final weeks his website said I had no criminal trial experience, and though he promised to remove that after I told him my experience he didn't. Readers can decide whether the following is a major complaint or not. Every law student is taught that if there are weaknesses in your case you want to be the one to disclose them. You don't want someone else to bring them out. This is particularly true for a prosecutor whose job is to represent all the people. Accordingly my campaign acknowledged problems with my candidacy, such as that I have lost the majority of my lifetime cases and that I have little experience handling criminal cases. At the Hayes Township board meeting in October I was asked if I had a criminal record. I candidly told of arrests including one for a felony -- for possession of marijuana in 1971. I beat them all in unreported decisions, except for one disorderly conduct in Chicago in 1968, which is the very first case noted on the site. It turns out now that a probate judge in Livingston County sanctioned John in the amount of $1000 for professional misconduct in a civil case he handled in October. Livingston is downstate between Detroit and Lansing. John had gone to the judge there asking for interim relief without telling opposing counsel. Instead of granting the relief the judge fined him, saying it was probably a grievable matter (at the state bar), and recommended John change his ways. She also assessed $17,000 against his client for forum shopping, apparently based on a previous finding of Judge Mulhouser in the Charlevoix probate court. I heard of this first the afternoon of election day. The News-Review political reporter Fred Gray called and told me. Immediately I emailed John asking if it were true. I wanted details and a copy of any motion to reconsider, at my expense. I didn't hear anything back. Fred mailed me the transcript two days later. I read it and emailed back to him with my analysis. I also expressed concern about the campaign finance violations already found against John, and the new ones alleged. Meanwhile one of John's backers, Diane Gustin called me. 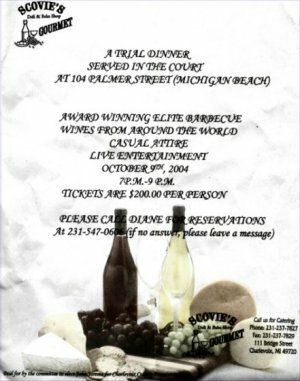 She had hosted his $200/plate elite barbecue fundraiser October 9. I told her of the transcript. She asked to see it. On Monday I brought it to her, along with the two emails, after clearing with Fred that it was all right to say I had got it from him. She took it to John's firm and also to Shirley Roloff, one of the commissioners. On Tuesday I re-emailed my analysis to Fred who had not received it yet, this time with a copy to John. Later in the day I got a call from John's firm. Diane had brought them the transcript. They were anxious to meet and explain the whole situation. The next day, November 10, I appeared at his office. John had four lawyers with him. In many of the cases I have handled over the years there were two lawyers on the other side. Rarely there have been three. Once I saw four. I have never gone up against five. We talked for an hour and a half. First, they said by all accounts I was an honorable person. Second, they showed me that the secretary of state had dismissed the second set of campaign finance violations from the Republican primary. Third, they convinced me that most of the fault for the $17,000 cost against their client lay in lawyers in the firm other than John. Fourth, they convinced me that the transcript from Livingston County had made its way to Charlevoix due to the efforts of Mary Beth. Fifth, they said I myself had committed a campaign finance violation by reporting my loan a few days late. Sixth, John said he still had a copy of my early literature which omitted the wording paid for by the Friends of Ellis Boal. Regarding my violation -- the rules say I should have reported the loan within 48 hours -- John said it was discrimination that he was fined for being a month late, while I was not fined for being a few days late. The five lawyers urged me to let the Livingston matter drop. I heard them out, and then gave my response: I had not publicized the matter generally, I had given a copy of the transcript to no one except John's supporter Diane, who had asked for it. Even if the transcript came to Charlevoix because of Mary Beth, an elected judge's accusation of professional misconduct was relevant to a campaign for the office of prosecutor. Even though most of the fault for forum shopping was not John's, a part of it was his. A candidate should acknowledge weaknesses in his or her own candidacy, as I had. John should have voluntarily disclosed the matter when it happened because it bore on the issue of his competency, a campaign theme of his. The campaign being over I congratulated him. But I still considered the Livingston County matter relevant. Citizens are entitled to know of something like this involving their chief lawyer. He should disclose it publicly now. I asked that he send me a copy of his motion to reconsider if he files one. I would not file a grievance. We parted cordially. Since then I have not distributed the transcript. I have not heard that he made it publicly available. I have not received the reconsideration motion. Later that day I returned a phone message left me by commissioner Shirley Roloff, concerned by the transcript and emails Diane had brought her. I summarized the contents of the meeting to her. I also called Fred Gray and left a voice message for him that part of my email analysis was no longer operative. I would like to thank your treasurer for bringing this error to our attention. John has not filed a complaint about the "paid for by" issue that he mentioned in the meeting. Areas marked with an asterix are those constituting my county commission district 1. Generally I scored stronger there, getting 646 of 2790 ballots cast, or 23.15%. My best single block was Charlevoix Township plus the three Charlevoix city wards, where I got 571 of 2161 votes, or 26.42%. In district 1, JoAnne got JoAnne got 802 of 2871 votes, or 27.93%. In the three Charlevoix city wards plus Charlevoix Township, JoAnne got 720 of 2244, or 32.09% of the votes. Counting just the city of Charlevoix, she got 478 of 1392 votes, or 34.34%. Ralph Nader ran with no party affiliation. He got 95 county votes. Green presidential candidate David Cobb got 30, behind 43 for the Libertarian candidate Michael Badnarik. Looking at prior years, in 2002 the Charlevoix Green Party fielded three candidates for county commissioner. In 2000 only the Green Party nominated a candidate for county drain commissioner. After the deadline passed, Republicans mounted a write-in campaign. JoAnne won going away. I will have a coalition of Green Party people. I expect the Democrats to support me, and a lot of Republicans to support me who were very much on side [in the Republican primary]. In my discussions with Murray, repeatedly he came back to the issue John had first raised at our lunch, whether I was running to win or just to raise Green issues and badrap corporations. If the former, I have to focus on issues like justice and administrative experience. If the latter, while being true to myself and projecting my values, I should take advantage of anti-Jarema sentiment. I suppose this was good advice, but there were few specific opportunities. At one of our joint appearances I brought out that John was responsible for the county's 2001 stormwater ordinance never going into effect because it wasn't properly published. And at the Hayes township meeting I mentioned his fine for campaign finance violations in the primary; but then someone asked about my arrest record in the 70s and I had to fess up. The truth was I wanted a positive campaign. I did little to stoke the anti-John vote. In the end I didn't get it, or at least I didn't get the pro-MaryBeth vote, or maybe the animus just all evaporated. Why would this be? In 2002, because of Michael Buttigieg's ("byoot-i-jay") activism, reputation, and hard work and because there was no Democrat on the ballot, I predicted a Green win in his race for commissioner district 3, which covered the county's eastern townships. This is the area where there is some Democratic strength. Instead he was trounced, though not quite as badly as I was this year. More disheartening yet that year was the result for Bill Henne, who came in third behind second-place finisher Democrat Paul Richards -- even though Richards told voters he hadn't realized Henne was on the ballot and people should vote for Henne. This was in an off-year election with no presidential candidates, when one would think straight-ticket voting would affect local results less. One township candidate ran unaffiliated against a Republican and got 39.46%, half again higher than JoAnne's percentage. In 2000, 4892 of 12,713 county voters, or 38.48%, voted straight-ticket. Of these, 92 or 1.9% voted Green. While straight-ticket voters can vote for individual candidates of a different party, I believe most don't. Published election results do not permit determination of, say, the number of ballots which were punched straight Democratic but where the voter also voted for JoAnne or myself. But I would think it is insignificant. In a 2003 case filed by an independent who had finished close to his Republican opponent in a township near Traverse City, the Michigan court of appeals upheld the constitutionality of straight-ticket voting. JoAnne did no specific campaigning other than to decorate her car, get some car signs, and ask a few people to write letters for her. Her pitch was simply her distinguished and well-publicized record of fighting for the environment, fighting Wal-Mart, and fighting for a salary and health benefits in the years she served. Cynically, her opponent Marc Seelye did no campaigning at all, other than to allow the Republicans to purchase yard signs for him, and to appear in Courier and News-Review articles to briefly compare his ideas and JoAnne's. But she got only 800 votes more than I, though I was practically unknown. There was no organized campaign against her. I have come to believe she just didn't stand a chance in the first place. She won in 2000 in large part because her write-in Republican-sponsored opponent did not receive the benefit of straight-ticket voting. There was one other difference. In 2000 she got 5349 votes, meaning she won 68% of the 7821 non-straight-party voters. One would think those same voters would have been supported her again this year. But she got only 2846 or 35% of the 8112 non-straight-party voters. Again, John got 3134, or 52% more, votes in the general election than he and Mary Beth combined got in the primary, suggesting that Democrats and independent voters preferred him to me. Why this would be so, and why the non-straight-Republican and non-straight-Democrat voters would have left JoAnne after 2000, is something we don't have our arms around yet. I suppose in some sense it means that Greens still command little loyalty even among its most promising constituencies, and much educational work lies ahead. Well, it has always been this way. But the numbers raise the question whether our Green Party chapter should dissolve and remand our politically-interested members to the other parties. The reason I reject that course even as our meetings continue to dwindle is the alternative is even worse. The main other game in the county is the Republican Party. The Democratic Party does not function much. It ran no candidates for county office. Of 61 township races, Republicans ran unopposed in 45 and Democrats in 10 (particularly in eastern townships). Of the 5 in which Republicans and Democrats opposed each other Republicans won by mostly large percentages in 3 and were close in the other 2. According to these numbers, the best chance most candidates would have would be to run Republican. That would be a difficult option for me, given the black attorney from Detroit incident in 2002, not to mention the party's support for the war in Iraq, opposition to unions, and other stands on national issues. Suppose the local Democratic Party were to take advantage of Bart Stupak's win, regenerate, and become a viable option for winning office? Would I recommend joining with them? The Democratic Party is a curious animal. On the one hand Democratic chairperson Kay Chase wrote a letter to the editor condemning the black attorney incident as I did. This year local party leaders Bill Lovett and Connie Saltonstall allowed me to leave literature at the DP Charlevoix headquarters in October, and encouraged my candidacy in other ways. On the other hand these same people participated in the Republican primary, signing Mary Beth's ad. And as Richards/Henne proved in 2002, merely being on the ballot the DP deprived the GP of votes. Finally, we disagree on so many national issues: the war in Iraq, the Patriot Act, single-payer health insurance, welfare reform, Nafta, the corporatization of the America. I have never voted for a Democrat or a Republican. I can't imagine suggesting that anyone do that now. Another option, concentrating Green political activity to non-partisan offices such as judgeships and city councils, at least for me is not attractive either. Apparently historically and nationally, Greens have done better in non-partisan races. While an important part of governance, the duties of those offices mostly do not involve exercise of political instincts, which of course is the whole reason to be involved in the first place. The last option would be for Greens to combine with the Libertarian, the US Taxpayers, or the Natural Law parties, which are the other small parties in Michigan. But they ran no candidates and have no presence here. To the extent I know their programs I disagree with them. So the local Green Party will continue soldiering along for now, perhaps in less animated fashion. None of the veterans of these fights has dropped out or left the party. Michael, Bill, Dave, Joe, and JoAnne are all active, each in his own or her own way. Statewide in Michigan, the party made modest gains. Four candidates topped the threshold and kept the party on the ballot for 2006. Art Myatt got 90,000 Green votes for Oakland County Executive, Jim Moreno was re-elected to the Mount Pleasant city commission, Green-endorsed Lawrence Kestenbaum upset an incumbent to win Washtenaw County clerk, and an Instant Runoff Voting initiative won in Ferndale. We were disappointed by the passage of anti-gay-marriage proposal 04-2. Kestenbaum by the way is a Democrat. I am surprised to learn that party rules permitted a Green chapter to endorse him. Nationally, Green Party results are available here. For myself, I am immensely pleased with the campaign. At the outset, as noted, I didn't think I would be. Of course 18½% disappoints me. But I worked hard, made no mistakes I can think of, responded well to various events, feel validated by the responses of people afterward, and most importantly learned much. The effort enhanced the reputation of our organization. In early December I tracked down the email address of David Chambers, my old criminal law teacher at Michigan. I don't think I have talked to him since 1971. Hoping he would remember me, I said I had used his name in the speech to the school teachers during the campaign. In the talk I had explained that four functions can be served by locking people up -- rehabilitation, isolation, deterrence, and vengeance. The same categories apply to executions (which Michigan doesn't have). I said I preferred the first and abhorred the last. Do you remember a class near the end of the criminal law class when I assigned everyone to read a pre-sentencing report in ... an armed robbery case, in which the defendant was pretty clearly a dangerous fellow (a long and escalating record of prior offenses), but he had also a childhood and life full of bad luck, mistreatment, and misery? During class, I pitted you against a student I thought (correctly) would be conservative.... [Y]ou argued wonderfully for probation while he argued heavy-handedly for locking the guy up and throwing away the key. Couldn't have worked out better. Plus, I had remembered his categories correctly. He said, "I think they still work as a way to think about sanctions." I never looked at law school grades so it was nice to hear I did something right back then, and to realize my views are still the same. But there is a dark side. The political process by its nature drives you to an outsized view of self. You are the avatar of your party's principles. Reminiscent of the cartoon above, the personal becomes political. What's good for you is good for the party. What's good for the party is good for the county. It's not a pretty picture. But something else works in a campaign that does keep you honest. That is the interaction and critiques of your comrades. Initially it was JoAnne and Tim who spent hours and days with me talking and thinking through the themes of my program, now on the front page. Later Murray helped with the message. I would not have come up with any of this myself. I am not religious, as I said to the teachers group, and this is not my prayer. But here in her way Ellen brought home the same points other friends had. In assessing the petty and mean-spirited conduct that so often comes before a criminal court, these lines sum up the proper attitude of the prosecutor. For me, Ellen's input demonstrates the centrality of organization and party as a vehicle for building, or helping to build, a social movement. I have been asked if I will run again. I am 60 so it's not likely, but I don't rule it out. Compared to the county as a whole, I did 4.76% better in the areas constituting my county commission district 1. JoAnne did 2.49% better in district 1. So if I get more well known a run for county commissioner could be a possibility. The only thing I can think I would do differently next time would be to start campaigning earlier. Email me if you have other ideas.